Adults employed full time in the U.S. report working an average of 47 hours per week, almost a full workday longer than what a standard five-day, 9-to-5 schedule entails. In fact, half of all full-time workers indicate they typically work more than 40 hours, and nearly four in 10 say they work at least 50 hours. The 40-hour workweek is widely regarded as the standard for full-time employment, and many federal employment laws — including the Affordable Care Act, or “Obamacare” — use this threshold to define what a full-time employee is. However, barely four in 10 full-time workers in the U.S. indicate they work precisely this much. The hefty proportion who tell Gallup they typically log more than 40 hours each week push the average number of hours worked up to 47. Only 8% of full-time employees claim to work less than 40 hours. These findings are based on data from Gallup’s annual Work and Education Survey. The combined sample for 2013 and 2014 includes 1,271 adults, aged 18 and older, who are employed full time. Is the average the best measure here? This is a classic case where the median and mean give you different conclusions. The median tells you that not much has changed from the standard: half of full-time workers work 40 hours or less. The average, on the other hand, is pulled up by those people working 50+ hours. 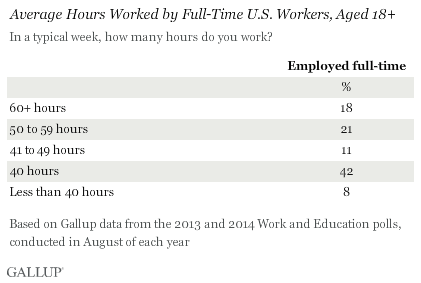 As the Gallup analysis goes on, it notes that there is a difference between salaried and hourly employees with salaried workers working more of those 40+ hour weeks. These salaried workers are likely white-collar and professional workers, people who may be working more but likely have more credentials, are getting paid more, and have higher-status jobs. Americans’ average wealth tops $301,000 per adult, enough to rank us fourth on the latest Credit Suisse Global Wealth report. But that figure doesn’t tell you how the middle class American is doing. Super rich Americans skew average wealth upwards. The U.S. has 42% of the world’s millionaires, and 49% of those with more than $50 million in assets. Both figures are true but they tell very different stories. America at #4 or #19? 1. Homeownership helps other countries pass the U.S. in median wealth since some have higher rates of homeownership (like Ireland and Spain) and their housing markets didn’t experience such a bubble. 2. Americans can borrow money more easily than some. This means we might be able to get our hands on more but leads to more debt which subtracts from our net worth. “The average Australian is a suburban Frankenstein”? Earlier this month the Bureau of Statistics, apparently hoping to deter Wayne Swan from cutting its allocation in the May budget, made a grab for publicity with a report on the characteristics of “the average Australian”. In the process it broke its own rules. Start packing your bags. The ABS decision to build a suburban Frankenstein for the sake of a publicity boost risks returning us to the point in recent history when certain people were labelled “unAustralian” if their language or behavior did not match the world view of Alan Jones, John Laws, Neil Mitchell or Andrew Bolt. The columnist may indeed be correct that the best way to do this would have been to use medians, rather than averages. But, the bigger issue here seems to be the idea that there is a “suburban mold” that Australians need to fit into. Not everyone likes this image as the suburbs are often associated with homogeneous populations, consumption and behaviors to keep up with the Joneses, and middle-class conservatism. Regardless of what the statistics say or whether a majority of Australians (or Americans) live in the suburbs, these suburban critiques will likely continue. I’ve written before about using the average vs. the median salary in the NBA lockout discussions and here is some more fuel to add to the fire: there are more $1 million lottery winners each year than NBA players who since 1990 have had career earnings of more than $1 million. As we can see, less than half of all NBA players in the last 20 years — the period of time where NBA salaries have been at their highest — have hit that $5 million mark over their entire careers. Just over one third — 33% — of all NBA players in the last 20 years have not even hit the $1 million mark in career earnings. And these numbers have been adjusted for inflation! Here’s a fun comparison: on average, 1600 people win a lottery of at least $1 million every year! That’s right; the lottery has produced almost twice as many millionaires in the last year as the NBA has in the last twenty years! The popular perception is that once a player enters the NBA they will earn millions and millions of dollars. The truth is that many players don’t hit that high mark. Both events, winning the big lottery jackpot and becoming a NBA player, are statistically unlikely. However, I suspect that most Americans would say that winning the lottery is much more unlikely. But this blog post points out that even when players do make it to the NBA, a third don’t rake in the big career earnings associated with professional athletes (measured here as $1 million). This would make for an interesting discussion starter for any professional athlete’s union: should the union be more concerned with allowing a smaller percentage of the athletes maximize their salaries or be more interested in guaranteeing a baseline for the majority of the league that are not stars? According to the TLC television show, “The Lottery Changed My Life,” more than 1600 new lottery millionaires are created each year. That doesn’t include people that have won jackpots of, say, $100,000 because than the number would be much higher. Still, 1600 is quite a high number. If 1600 win at least a million in the lotto every year, it means that there are more than 130 each month, more than 30 each week, and more than 4 each day. That’s a lot of winners. It would be interesting to see more documentation on this. More than two decades of Pew Research surveys confirm that assessment. “In their views about interracial dating, for example, Millennials are the most open to change of any generation,” the report states. The problem is that tolerance doesn’t necessarily mean understanding, researchers say. Adults working with teens say they see an unsettling strain of desensitivity among young people. In May, University of Michigan’s Institute for Social Research issued a report on an analysis of 72 studies on the empathy of nearly 14,000 college students between 1979 and 2009. The result: Today’s college students are about 40 percent lower in empathy than students two or three decades earlier. The researchers suggested that disheartening trend may have to do with numbness created by violent video games, an abundance of online friends and an intensely competitive emphasis on success, among other factors. This is a very interesting conclusion: the younger generation is more tolerant but less understanding and empathetic. So what exactly does this tolerance look like? The lack of empathy, in particular, is interesting as it is another step beyond tolerance. Empathy is the ability to understand and take on the feelings and perspectives of others. Is tolerance the end goal or is there more that we should be striving for as a society? This conundrum reminds me of Jesus’ Sermon on the Mount, the current topic of our Sunday School class. In verse after verse, Jesus suggests that Christians aren’t just supposed to put up with people: “loving your neighbor” means taking an extra step toward people, bringing reconciliation, peace, and blessings to other rather than just letting them be or letting them pursue their rights in their own space. Loving people means putting them above yourself, something beyond both tolerance and empathy. One outcome suggested by this story is a meanness or harshness among high schools. Teenagers understand about respecting difference but this doesn’t translate as well into personal interactions where being mean is seen as being cool. Another possible outcome is living alone, keeping people at a distance. I will consider this in part three of this series.